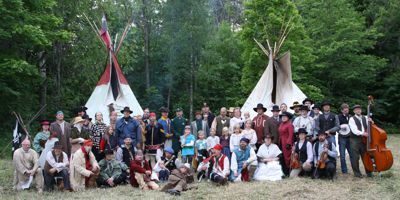 Classic Old Western Society of Finland ry (registered association under Finnish legislation) is an association, which aims to include all possible matters related to the _Old West_ to its activities. The purpose of the association is to promote the awareness of the legendary old west history, culture, and weaponry, as well as to support the sport shooting and collecting old western weapons. C.O.W.S. aims on joining together those people who are interested in wild western clothing, music, dance, cuisine, riding and/or culture. The association is not limited to cowboy culture, but includes people interested in Native American cultures and various professional groups and trades of the frontier. For example, in the C.O.W.S. Buckskinner section one can find enthusiasts of the 18th century, mountain men and buckskinners. In addition C.O.W.S. promotes the historical study of the Finnish immigrants to the great west. 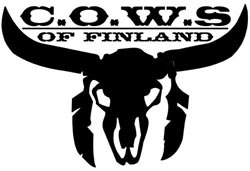 As the interest to re-enactment is growing globally, C.O.W.S. aims to keeping contact with other enthusiasts internationally and participating on international gatherings and competitions. Many members of the association enjoy shooting sports, either with the muzzleloaders, or with the cartridge guns of the late 19th century. In the buckskinner competitions woodsman skills like fire building or axe throwing can be included, alongside sharpshooting with the muzzleloaders, whereas Cowboy Action Shooting ™ is a fast paced and impressive international sport, shooting the guns used in the taming of the west – single action revolvers, lever action rifles and shotguns, or reproductions of those. Many members of the association are very serious about their interest to the _Old West_, but principally the target is to have fun, enjoing the “Spirit of the Game” or “Code of the West”.